There are literally a couple hundred versions of the "Blow Out" First Aid Kit on the web. Each version has their own content list. In this blog entry we will define what a Blow Out Kit is, how it differs from an expanded First Aid Kit and why. We will also discuss why the average guy who lives, say . . . near Detroit . . . (or any other major crime infested city) should have a BOK. "The Blow Out Kit . . . Not JUST for soldiers"
WHAT IS A BLOW OUT KIT (BOK)? - A BOK is a small first aid kit, that treats the three most common and preventable causes of battlefield death in accordance with Tactical Combat Casualty Care doctrine. Through self application of the kit (if you are able), or by a buddy (if incapacitated), the BOK is to aid you in getting back "into the fight" as quickly as possible so that you can stop your enemy and save your team (See Side Note 1 below). 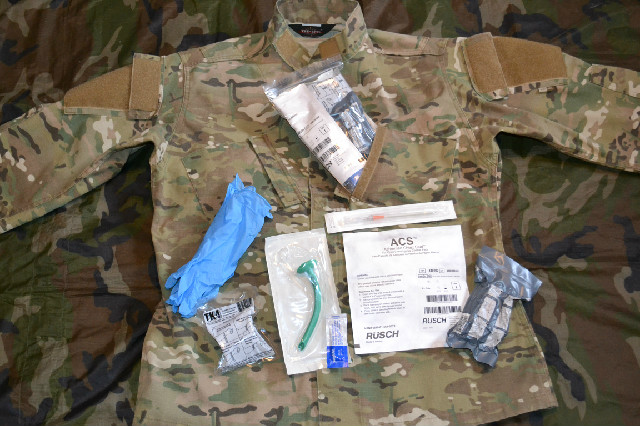 The BOK has only the items that are absolutely necessary to save lives that are in immediate danger of expiring due to arterial bleeding from an appendage, sucking chest wound, or clogged airway (The three most preventable causes of battlefield death). It's designed to be small and light weight so that you can have it close by (always immediately accessible), and to limit the items to that which you only will immediately need to save a life (so you are not fumbling through sutures and stethoscopes, while you're trying to turn off the hose of blood coming from the area that used to be your lower leg). Very rarely on the net do you see any of this mentioned. Why is that? Who knows, it could be a lack of study time in what Tactical Combat Casualty Care doctrine is and how it relates to the BOK. It could be driven by excluding certain items due to pricing margins . . . or any number of combinations. Either way it causes a major problem for the average person and what happens is that a bunch of different variations of Blow Out Kits are sold, leaving the consumer to wonder how one BOK is better or worse than another? *Side Note 1: How is treating battlefield preventable deaths applicable to John Q Public you say? Anyone who's ever lived in or near a major city or ghetto can tell you gun fights do happen, gunshot wounds do need to be treated to save lives, and if/when the SHTF, there is going to be a potential for an even higher number of shootings. As mentioned earlier, the drug addict, carjacker, or mad man is the enemy of the citizen. The battlefield is the area that the altercation happens in. The "fight" may be the race against time to save one's life. The actual attacker may be gone, but the enemy now becomes the loss of life. The tragedy in Boston is a perfect example of this (what was encouraging were the citizens jumping into action to help save lives). So it might make sense how TC3 training and kits are very applicable to the John Q of this day and age even if you don't carry a firearm for a living like soldiers do. The simple trip across town today could end up in a carjacking for the guy sitting in traffic next to you, which could leave him bleeding out and you with the decision to help him. Would you know how? Would you have the required items to save his life? *Side Note 2: Can you please define Tactical Combat Casualty Care in a nutshell? Tactical Combat Casualty Care is care provided to treat the three most preventable causes of battlefield deaths during the following situations. 1. Providing Care Under Fire - CUF - (Providing care while the attack is happening). 2. Tactical Field Care - TFC - (Providing care after the attack has stopped or paused). 3. Combat Casualty Evacuation Care - CASEVAC - (Providing care to evacuate the casualty for more thorough medical attention). The link below is a great place to start with what should be in your "BOK". The second link is an excellent look at the same ex-SF soldier's perspective on TC3. Take it to heart, the guy knows his stuff. Great Lake Survival has put together one of the most affordable Blow Out Kits around, with all of the items needed to provide immediate life saving care in line with tactical field care doctrine. We don't push a lot of our products on this blog because they generally sell themselves. However we have a good product, it's relatively affordable, so you might consider it.